Package includes hire of two Up-lighters and cables. Package includes hire of four Up-lighters and cables. Package includes hire of six Up-lighters and cables. Package includes hire of eight Up-lighters and cables. Hire our fantastic Up Lighters to bring an amazing atmosphere to your event. 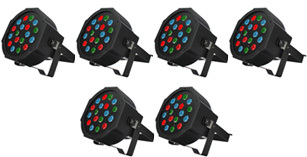 This set of 6 LED uplighters can transform a medium venue from looking dull and dated, to vibrant and new, and are the most cost effective way to decorate walls and ceilings of halls, marquees and bars. These plug-and-play wall washers throw colour across the walls and ceilings, reflecting shadows, and highlighting curves and features of a room. You can set any colours to suit your room, and even change the colour of the light during an event to move the party on from brighter colours during the day to more warm colours at night. Up-lighters can also be used during discos and parties, changing colour in time with the music, or even to dress a restaurant during a meal with single colours or soft fades. 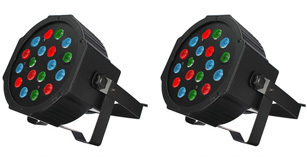 They are an extremely versatile and essential tool for dressing wedding venues, marquees, halls, bars and function rooms.